Here you’ll find travel reports about Monte Palatino. Discover travel destinations in Italy of travelers writing a travel blog on FindPenguins. I made a mistake in last post. It was Orvieto that we stopped at yesterday. Instead of tourist bus some of us ended up on a local bus with many stops before we got off, of course, at a church! We stayed our 2 nights in Rome in a former convent. When the elevator stops at floors a bell rings like a church bell. Have had trouble getting them to turn AC on and it is very warm, 28 C today. 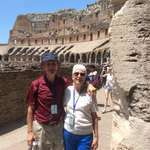 We left at 7:30 to tour the Vatican museum, the Sistine chapel, and St Peter’s Basclilliac had 50 minutes for lunch and then on to the Colosseum. I really liked it as it was easy to picture what it had been like. It helped if you had seen Gladiator or Ben Hur?? Better to be a gladiator than a slave because if you were a slave working on building the Colosseum you likely would last 6 to 12 months. Then to Forum and we were hot and tired by that time. It was 3 o’clock. That was a full day! You must have been ready to hit the sack. So now that you are home, do post what you do in Oshawa? Played bridge today? Went shopping?? I sent the message before I had finished sentence. I did enjoy writing the details of everyday so now when our memories fail us we can go back and check! We left Florence and stopped at SAN Gimignano a town very high up on a hill. We took an elevator and then buses to get to top. We had lunch in an Italian restaurant, 4 courses. In this case I did like the antipasto. At other restaurants I didn’t like it. A creamy tomato sauce on some pasta and then pizza and briscotti. The chef made homemade pasta and chatted while we were eating, don’t think l will be making pasta anytime soon! The town was beautiful and had a gelato and shopped. Very unusual location for a village.